Alex Rins finished second in the Dutch Grand Prix at Assen, in a race that will go down as classic. 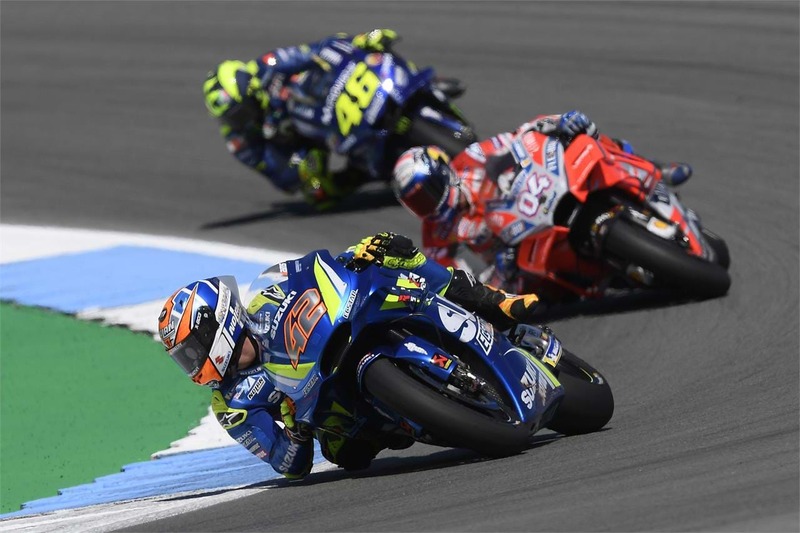 Rins made a strong start from his second row grid spot, and was part of the leading group of nine, before making his way through the pack with a series of passes. Eventually taking the race lead on his GSX-RR, the nature of the battle saw positions swap frequently, and he dropped back down the order after being run out to the edge of the track at De Strubben. He regrouped and challenged again, making a last-lap pass to take second place. Rins said, "It was a fantastic battle and I learned a lot of things during the race. Our race pace was good and I was able to enjoy it. There were a lot of over-takes and tight moves, so I was always trying to push to stay with the others and hold my space. I feel very positive with my bike and with my team, we all really want to improve and win. "We’ve had a really competitive bike since Qatar, but we’ve been able to change a few things to get extra power and better performance, so I hope I can stay at the top for the next races too. I feel confident for Sachsenring."